There is no single prescribed way to operate an association. With more than 150,000 in the U.S., the management and governance styles are diverse. At board retreats volunteer leaders have said, "These concepts will transform our association. They are similar to the principles in the book, 'Traction: Get a Grip on Your Business' by Gino Wickman." "I believe the same systems used to promote our business can be applied to an association to improve outcomes and performance," said Ryan Retif, president of Retif Oil and Fuel, and a board member of the Louisiana Oil Marketers and Convenience Store Association. The essence of "Traction” can be described by a question: "Do you have a grip on your business, or does your business have a grip on you?" It offers an easy-to-follow operating system for entrepreneurs. The principles are similar to another book, "The E Myth: Why Most Businesses Don't Work and What to Do About It." The "E" stands for entrepreneurial. Both books report that half of all new business fail within five years. The failure is blamed on a lack of systems and best practices. The authors offer similar solutions: clear mission, the right people, measure performance, keep it simple, and document processes. "Traction" describes an "entrepreneurial operating system" (EOS) with six key components. A system can be defined as connected parts that form a better way of doing things. The concepts are similar to the national standard for performance criteria awarded in the U.S. and by most state governments. The Malcolm Baldrige Award is the nation's only presidential recognition for public and private sector performance excellence. The seven elements include leadership, strategy, customers, measurement, workforce, operations and results. 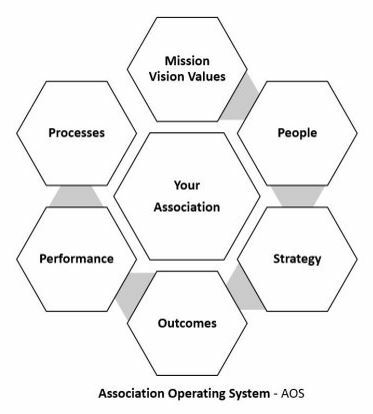 For associations, let’s call the concept the AOS — the association operating system. Each component should connect with best practices and documentation to support high-performing organizations. The association was started for a compelling purpose. It is often communicated in a trio of clear, crisp statements. The mission should be referenced frequently. Nearly every activity, discussion and decision should advance the mission. "Helping all members succeed," is the straightforward mission at the Massachusetts Dental Society. The board should frequently ask, "How does this advance our mission?" The vision is a long-term perspective of what success looks like for the organization. The best way to explain it is to read the vision of the Canadian Cancer Society: "Creating a world where no Canadian fears cancer." Many organizations adopt a values statement applicable to volunteers and staff. Around the globe the general values of associations are accountability, transparency, integrity, respect and innovation. Associations are people-centric. From founders to future leaders, they rely on people for governance and management. The concern is that people can be unpredictable or unreliable. When people fail the organization,the organization fails. "Traction," "E-Myth" and in "Good to Great" by Jim Collins all prescribe getting the right people in the right seats. For example, it can be fruitless if the bylaws require the immediate past president to chair the conference committee if he or she has no interest in meeting planning. People need to be positioned in the right roles. Everyone should be supported by job descriptions, orientation, governing documents and technology. Processes are a way of doing business in the association. Events and activities in associations tend to be cyclical, thus there is opportunity to perfect the processes. For instance, monthly publications and financial reports, quarterly meetings, and yearly conferences, budgeting and nominations. Document the steps for every function in the association. Identify best practices to improve the processes. Detailed processes allow any person to step into a job with efficiency. Store the documents by category or in manuals; for example, leadership, management, policies and finances. Successful organizations monitor their performance. The board should often ask, "How will we measure the program’s success?" Use scorecards and dashboards to report progress at every meeting. Track measures like the market share of potential members, and the retention rate. Use external benchmarks to compare the association against outside resources, such as operating ratios or compensation studies. The strategic plan is the road map for board, committees and staff. Keep it on the board table and in committee folders. Frequently ask, "What part of our strategic plan does this advance?" The plan should be compelling to members and stakeholders. Use a postcard, brochure or business card to inform others about the association’s goals. Staff will track it with a work matrix. Review the plan at least annually. Appoint a strategic plan champion on the board to report on progress. Why exist if results are not significant? Decisions should advance the mission and deliver meaningful results. 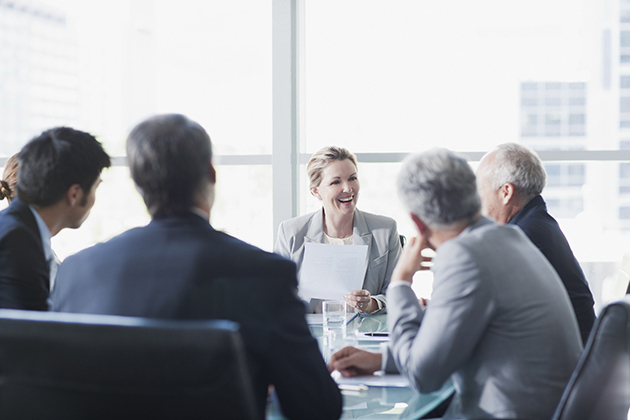 Board meetings are a place to govern and achieve results, not just to enjoy a meal and exchange information. The outcomes will be internal and external. Though associations may not give it much thought, they positively impact employment, economy, safety and quality of life. Internally, associations provide value to members that one hopes will exceed the cost of the dues investment.